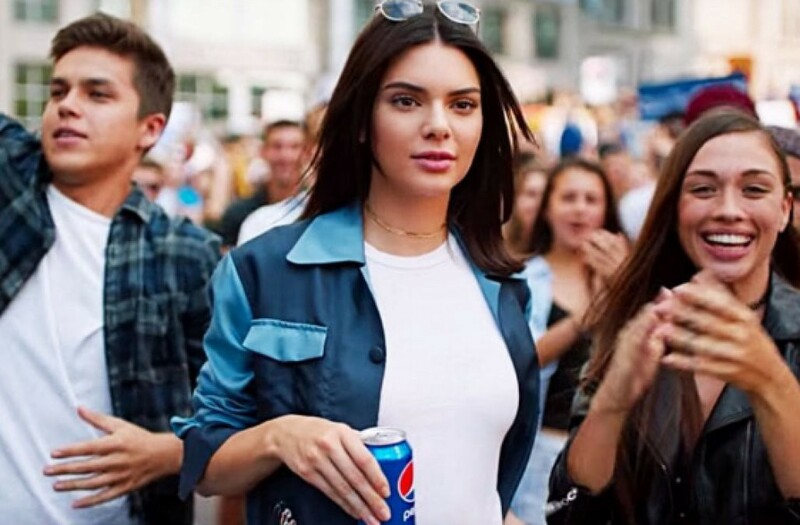 Our new Pepsi™ ad was a viral phenomenon! You’re all getting a big bonus for creating a campaign that so effectively tapped into the zeitgeist. Let’s strike while the iron’s hot and begin production on the remaining spots. Remember, our overarching goal is to unite the public in an experience they all share — disliking our brand. Here are the approved scripts. A montage featuring hip, multicultural, socially conscious young folks in familiar scenarios. First, a young woman enters a movie theater and goes up to the concessions counter. Elsewhere, a young man goes up to a bar. Finally, a man — and another man! — sit down for a dinner date. (This is already insanely progressive.) Expectation and excitement are in the air for all of our young heroes. WOMAN AT MOVIE THEATER: One small popcorn and a large C*ke. MAN AT BAR: I’ll have a rum and C*ke, please. MAN AT DINNER: I’ll just have a C*ke. OTHER MAN AT DINNER: Make it two! WOMAN AT MOVIE THEATER: Yeah, that’s fine. MAN AT BAR: Yeah, that’s fine. MAN AT DINNER: Yeah, that’s fine. OTHER MAN AT DINNER (Exasperated, but in a charmingly playful way that indicates he’s not really annoyed, just trying to find a way to flirt with his date): But, Dennis! Flash forward a few minutes. Montage of our young heroes accepting their beverages with feigned enthusiasm. Their sympathetic eyes say: “Well, it’s not the waiter’s fault.” They all gingerly take a sip. After all, they’ve come this far. WOMAN AT MOVIE THEATER: Ugh. MAN AT DINNER, WHO WE NOW KNOW IS NAMED DENNIS: There’s definitely a difference, you know? OTHER MAN AT DINNER: It’s that weird aftertaste. DENNIS (With a smile that says, “I guess I have something in common with this guy — this could be the beginning of true love!”): Hey. You’re right! A hip, multicultural young woman at the Women’s March on Washington. She carries a sign that says “My Body, My Choice.” She wears one of those funny pink hats. Cut to a hot, angry looking white man on the sidelines. He holds a sign that says “We Won. Get Over It!” He locks eyes with the hip, multicultural young woman. There’s a moment of undeniable tension. Does she hand him a Pepsi™? Nope. Does he hand her a Pepsi™? Heck, no. Instead, they lock eyes. Surprise! It’s true love. A romantic montage follows. The two of them make out behind the Washington Monument. They’re running through the streets hand in hand, the White House glowing in the distance. The light changes, and it’s the next morning. She sneaks out of his room, careful not to wake him — because no matter what changes in this crazy world of ours, our men will always need a good night’s sleep. She goes inside. Everywhere, doctors and medical assistants are packing up boxes. DENNIS, WHO IS ALSO A NURSE: Can I get you something, hun? Dennis stops in his tracks. A worried look crosses his face. DENNIS, WHO IS ALSO A NURSE: We only have Pepsi™. OUR HEROINE: Yeah, that’s fine. Dennis has lost his nursing job and he is no longer dating the guy from the first spot. He walks down a desolate beach, Pepsi™ in hand, depressed. Suddenly, a makeshift raft pulls ashore, filled with refugees escaping persecution and war. DENNIS: Oh, my God. Are you guys okay? REFUGEE #1: Freedom. We seek refuge and freedom. REFUGEE #2: And clean drinking water. Please. Our women and children are severely malnourished and dehydrated. DENNIS: How about a Pepsi™? The refugees consult among each other, shaking their heads and frowning. They turn around their raft and go back to sea. DENNIS: Wait! Take me with you! Dennis runs toward the boat, but it is already drifting towards the horizon. He collapses on the sand, sobs racking his body. Thanks again for your great work, team! You’re proof that advertisers continue to drive the national conversation. Writer. Funnyperson. Hiding in the Catskills. The New Yorker, McSweeney’s, Splitsider, more.